Nobody believes in the simple narrative arc of Modern Art anymore; even so, Painting in Italy 1910s-1950s: Futurism, Abstraction, Concrete Art at Sperone Westwater is an instructive glimpse into the fullness and complexity lying beneath thumbnail histories of the avant-garde. Of the three styles cited in the exhibition’s title, Italian abstraction between the two world wars is the least well-known. Painters such as Mario Radice, Mauro Reggiani, and Atanasio Soldati were entirely new to me, and while not particularly groundbreaking, their work comprised a colorful, idiosyncratic response to Synthetic Cubism at a time when many Italian artists, seeking to curry favor with Mussolini’s imperialist fantasies, took a sharp right turn toward Neoclassicism in all of its sentimentality and bombast. As Maria Antonella Pelizzari writes in the exhibition’s lavishly illustrated, 388-page catalogue, “Mussolini, unlike Hitler, never decreed an official state art, nor did he ever single out a ‘degenerate art,’ even when racial laws were brutally introduced in 1938.” This could be one reason why, for the most part, the work in this exhibition seems so oddly serene in the face of seismic political events. 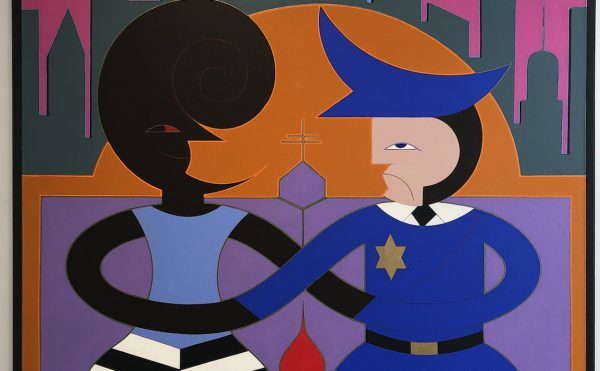 One of the artists included in the show, Corrado Cagli, who was Jewish, fled first to France and then to the U.S., where he enlisted in the military and eventually took part in the Normandy invasion and the liberation of Buchenwald. Another, Alberto Magnelli, who had decamped to Paris before the outbreak of the war, was forced to escape to the southeast corner of France to protect his Jewish wife. Many of the others, however, remained in their home country and continued to produce art. 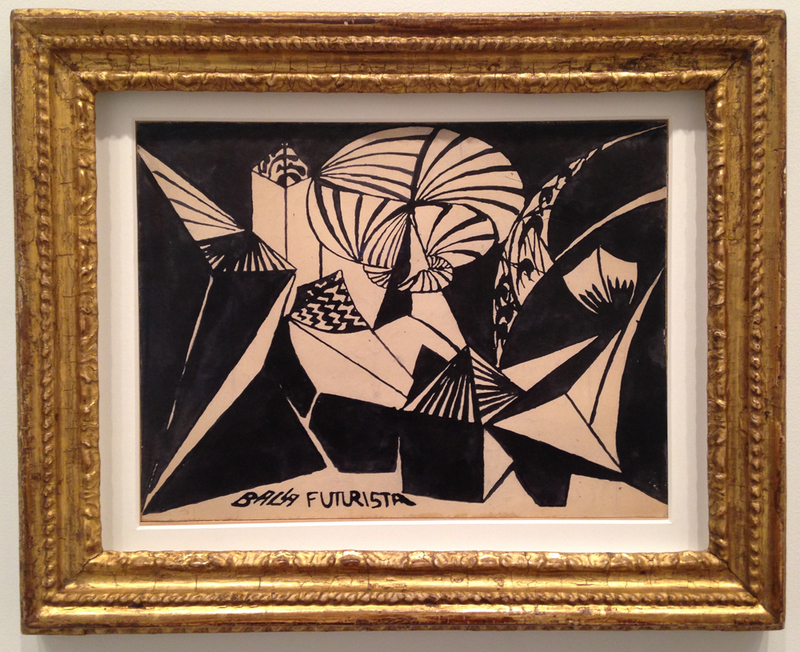 Giacomo Balla, “Fuochi d’Artificio (Feux d’Artifice)” (1916/1917), ink on cardboard, 10 x 14 inches. The most recognizable names among the thirty-plus artists in the exhibition are the Futurist Giacomo Balla; the canvas-slashing Lucio Fontana; and Ettore Sottsass, who is best known as an architect and designer. Balla can often be overly literal in his depiction of movement (as in his “Dynamism of a Dog on a Leash” of 1912, where the dog’s scurrying legs and wagging tale are rendered as time-lapsed blurs), but his works here are almost entirely abstract and refreshingly restrained. These include the interlocking circles of his “Iridescent Interpenetration” watercolor studies (1912-13) and a stark drawing in black ink on cardboard for a light show he staged in 1917 to accompany a performance of Igor Stravinsky’s 1908 orchestral work, Fireworks (Feu d’artifice). (The 2014 exhibition, Italian Futurism, 1909–1944: Reconstructing the Universe at the Solomon R. Guggenheim Museum, New York, featured an immersive reconstruction of Balla’s colored light cues for Stravinsky’s score.) There are also seven arresting works from the years coinciding with World War I, which were done in mixed media on postcards and envelopes, some inscribed with patriotic exhortations. Lucio Fontana, “Studio per decorazione spaziale (Study for Spatial Decoration)” (1952), pencil, watercolor and gouache on paper, 8.3 x 11 inches. Fontana, on the other side of the exhibition’s time frame, is represented by two works, both of which lie outside of his signature surface incisions. One, in black aniline on paper mounted on canvas, bears the same title he gave his slashed works — “Concetto spaziale (Spatial concept)” (1959) — but here his material intervention takes the form of punctures and V-shaped gashes going every which way, a much more brutal approach than his more elegant, mostly vertical scalpel slices of a few years later. “Concetto spaziale (Spatial concept)” is among the most recent works in the show, and it is by far the most formally radical, though there are two pieces from 1937 made by Sante Monachesi out of punched, punctured and hammered aluminum, both titled “Alluminio a luce mobile (Light mobile aluminum),” which seem to prefigure Fontana’s physical manipulation of surface material. The other piece by Fontana, “Studio per decorazione spaziale (Study for spatial decoration)” from 1952, is conventionally painted in watercolor and gouache on a letter-size sheet of paper. 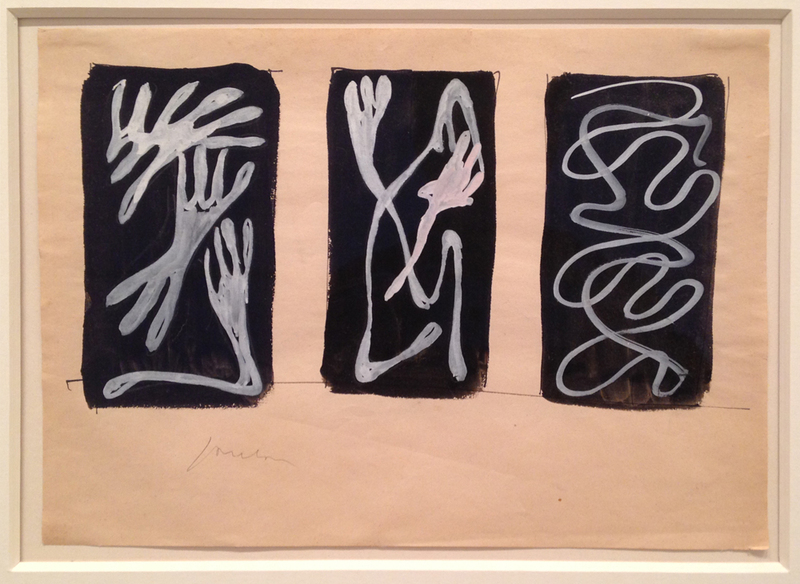 It features three black, vertical rectangles each containing a set of bone-white swirls and squiggles that recall Pablo Picasso’s Surrealist works from the 1920s. Picasso, of course, dominated the Western art world throughout the decades covered by the show. He knew Alberto Magnelli and visited the studio of Enrico Prampolini, whose paintings also bear a kinship to his Surrealist period. But while the influence of Cubism, as suggested above, is to be found everywhere in the exhibition, the Italian version incorporated a distinctive utopianism that feels very different from the formal concerns brought to the style by Picasso, Georges Braque, Juan Gris, and others. A few years after the war, Badiali went back to her studio, proving an ongoing attraction to the art that she had practiced in the mid-1930s, under the influence of Rationalist groups in Como and Milan. 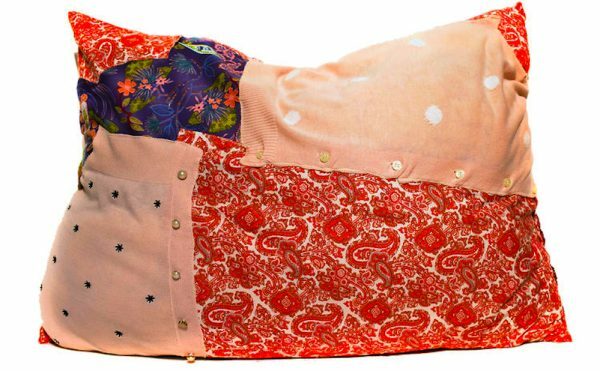 These new canvases, together with new collages, showed no traces of her existential wounds. There are two works by Badiali in the exhibition, and while both were done before the postwar period cited by Pelizzari, it is interesting to note that the earlier of the two, an oil-on-cardboard titled “Studio per Composizione n. 12 (Study for Composition n. 12)” (1935), with its tilting central oval and collapsing planes, is much more unstable than the later work, an oil-on-board that was started in 1937 and finished in 1942. 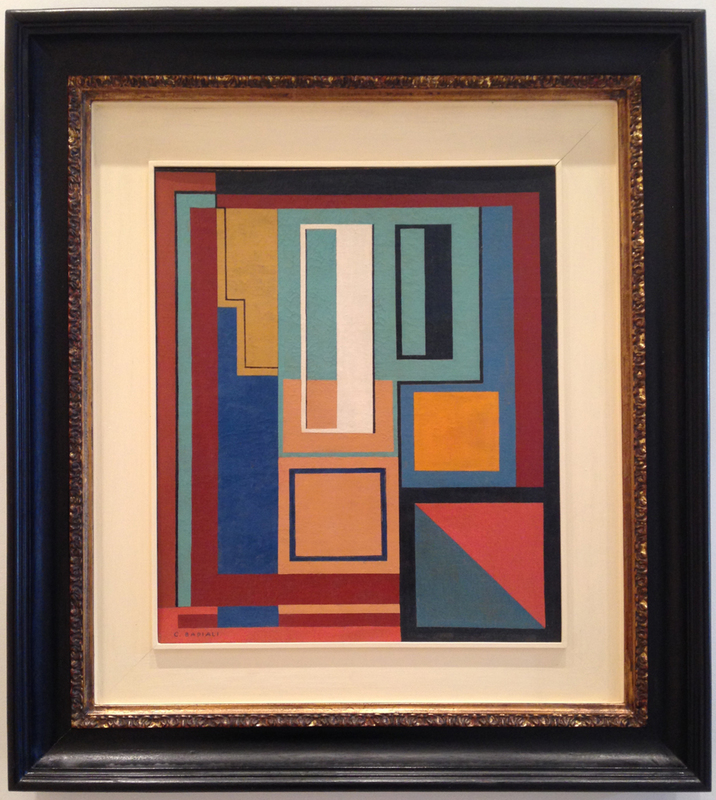 Simply called “Composizione (Composition)” — a title shared by adjacently hung geometric abstractions from the mid-1930s by Reggiani and Soldati — the painting is a boldly colored series of interlocking squares and rectangles; there isn’t a single diagonal present except for one bisecting an orange and blue square in the lower right corner. The pronounced use of black, which acts as a band that begins on the top edge, travels down the right side and terminates as a border surrounding the orange/blue square, might be indicative of encroaching dread, but it doesn’t unbalance the painting’s Apollonian relationships of green, yellow, white, blue, orange, ochre and brown. It is crucial to understand that these individuals were, in one way or another, deeply touched by the war, and their personal histories speak of this. Several of them (Badiali, Nigro, Soldati, Garau, Bordoni, Veronesi, Turcato) had chosen a militant position, fighting as partisans during the Resistance. Others had been forced into exile (this is the case of Cagli as well as of Lionello Venturi, the art historian who had refused to pronounce the Fascist Oath in 1931). The majority had remained in Italy during the Fascist years believing […] that a new modern world was conceivable through this regime. As the war ended, most of them were deeply disillusioned and expressed the need for a tabula rasa, a radical regeneration of those languages developed and consumed throughout the 1930s and during the war. Those languages had reached their conclusion. Bruno Munari, “Negativo – Positivo (Negative – Positive)” (1951), oil on masonite, oil on masonite, 13 x 12.8 inches. Although this work didn’t take the extreme materialist turn adopted by American Minimalism about ten years later, its flat, graphic geometry does feel qualitatively different from the earlier works in the show. 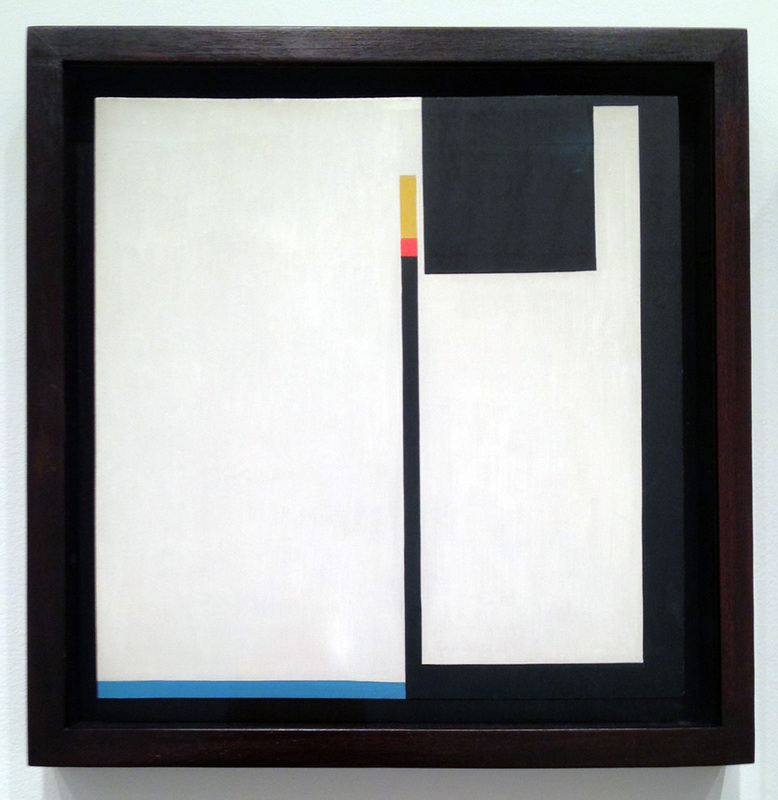 It’s a conceptual shift that’s especially noticeable in Munari’s two paintings from 1951, both titled “Positivo – Negativo (Positive – Negative).” As implied by the title, it is difficult to tease apart the figure from the ground, and the stripped-down color — blue, black and white in one and blue, black, orange, yellow and white in the other — is electrifying in its simplicity. If we look at Minimalism, we see a collection of ruggedly individual approaches, from the black stripes of Frank Stella to the steel plates of Richard Serra to the plywood boxes of Donald Judd. The spirit of M.A.C. was similarly splintered, but typical of a country that, despite it’s mid-19th-century unification, never quite moved past its social, cultural, and psychological temperament as a collection of city-states, the differences were as much about regional factions as they were about singular personalities. Albino Galvano, “Se e no (Yes and No)” (1952), oil on canvas, 71 x 51 inches. 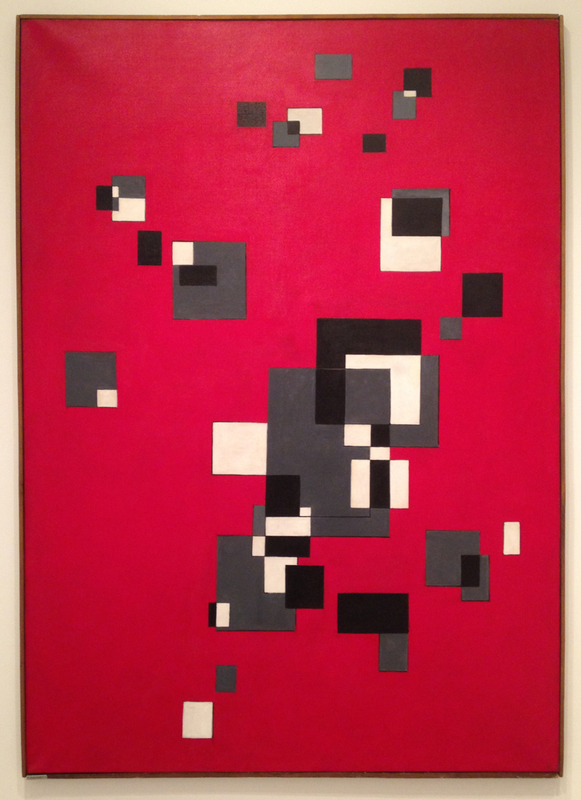 Galvano’s large oil on canvas, “Si e no (Yes and No)” (1952), with its overpowering red field populated by overlapping white, black and gray rectangles, is densely tactile, manifesting an insistent materiality at odds with the open-ended space surrounding the crisply delineated geometric shapes. It’s a statement that’s as emphatically purist as it is anchored to the earth — a duality that can be applied to much of the work in the show. Abstraction for many of these painters was not far removed from the day-to-day — industrial design, typography and architecture — which aligned them in their aesthetic and utopianism to their counterparts at the Bauhaus. But the tension between the ideal and the quotidian also links their work to the 700-year-old humanist tradition of Italian painting, in which the spiritual, in the form of geometric abstraction, suffuses the mud-encrusted details of daily life and turns art into a signpost for redemption. Painting in Italy 1910s-1950s: Futurism, Abstraction, Concrete Art continues at Sperone Westwater (257 Bowery, Lower East Side, Manhattan) through January 23.